If you are looking for ways to incorporate environmentally friendly products into your home décor, a set of organic cotton sheets from Nest Bedding® is a great way to get started! Made with Global Organic Textile Standard (GOTS) certified organic cotton, these sheets are they are beautiful, luxurious and comfortable. When Nest Bedding® offered me an opportunity to review their organic cotton sheets, I wasn't quite sure what to expect. I know that Nest Bedding® has a reputation for quality mattresses, so I expected that their sheets would be well-made. However, since they are organic and made from Fair Trade Certified Cotton, I expected that they would be more utilitarian than luxurious in appearance and feel. I was right about the quality of workmanship, but wrong in expecting anything less that sheer luxury. These sheets are cotton sateen, which means they have a very smooth, silky feel. They also seem to stay very cool, which is a great advantage in the warm climate where I live. They have a 300-thread count, which isn't particularly high, but they feel just as wonderfully luxurious as other sheets with a higher thread count (and a much higher price tag). These sheets are available in your choice of blue, ivory or white, so there are options available that will work well with the décor of any bedroom. You can choose a plain or pleated hem on any of the colors. They will work with mattresses of any thickness up to 16 inches. These sheets are quite affordable, with pricing for sets varying from $129 (single) to $179 (California King) based on size. Financing is also available to those who qualify. If you're interested in financing, payments can be spread out over 12 months (if you qualify). Interest charges apply. You can also lease to own. These sheets are environmentally responsible in every sense of the word. Not only is the fabric organic and Fair Trade Certified, they are also manufactured using responsible practices. Even their packaging materials are eco-friendly. These wonderful eco-friendly sheets will go a long way toward helping you get a good night's sleep every night. Not only do they look and feel terrific, they also represent a simple way to incorporate more eco-friendly products into your home. It's great to know that you can sleep in comfortable luxury while also making environmentally responsible purchase decisions. 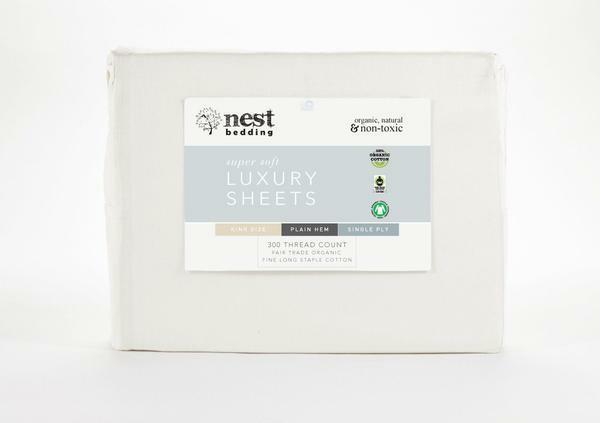 Note: Nest Bedding® provided the author with a set of these sheets at no cost in order to conduct this independent product review. The options shared in this article are solely those of the author.